Published on November 9, 2011 November 21, 2011 by cara.b.b. as i mentioned here, i am not at all talented when it comes to my hair. i don’t have the patience to spend time on it, and it usually doesn’t turn out the way i envision. that said, i rely on product to help my sorry skills. 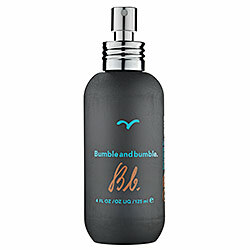 i recently started using these from bumble and bumble, and they will forever stay a staple. i use a dime to nickel-sized dollop of the styling creme on my roots, which gives me the lift i desperately need, and the surf spray adds some nice wave. it’s great if i’m letting my hair air-dry and especially good if i diffused or curled my hair the day before – it does a great job at reviving it. i spray it on when my hair is damp or dry. the nice thing about this stuff is that you don’t need a lot, so it lasts a long time. what are your hair secrets? care to share? Previous who needs a kitchen island!?! I’m a long-time fan of B&B’s Surf Spray. I also swear by their Texture creme, L’Oreal’s Elnett Satin hairspray, and TRESemme’s Fresh Start dry shampoo. thanks for the tips lauren – i’ll have to try the texture creme!